This set of Polymer Engineering Multiple Choice Questions & Answers (MCQs) focuses on “Polypropylene”. 1. 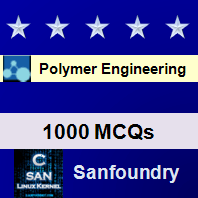 Which of the following kind of polymer has the highest percentage in polypropylene? Explanation: The reaction conditions in the polymerization of propylene are varied so as to favour the formation of isotactic polymers. Commercial polypropylene is 90-97% isotactic. 2. What is the approximate density of the polypropylene? Explanation: The density of polypropylene is about 0.90 g/cm3 and it also the lightest homo-polymer known. 3. What are the temperature and pressure conditions for the polymerization reaction of propylene? Explanation: The polymerization reaction of propylene takes place at a temperature range of 50-80 ᵒC, generally at 60 ᵒC and at a low pressure range of 5-25 atm. 4. Which of the following is used as a catalyst in the polymerization of propylene? Explanation: The polymerization of propylene take place by the Ziegler process in the presence of Ziegler Natta catalyst i.e. titanium halide and tri-alkyl aluminium. 5. Which of the solvent is used to check degree of isotacticity of polypropylene? Explanation: The degree of isotacticity or isotactic index of polypropylene is calculated as the percentage of the polymer that is insoluble in n-heptane. 6. Which of the following properties of polypropylene makes it inferior, when compared with polyethylene? Explanation: Polypropylene becomes brittle when it is close to 0 ᵒC, and hence in this view it is inferior to polythelyene. Rest all other properties makes it superior to polyethylene as it has high tensile strength and clarity, and is occupied with less stress cracking problems. 7. Which among the following polymers is more prone to oxidation or aging? Explanation: Polypropylene is more prone to oxidation and aging than LDPE and HDPE, as it contains higher concentration of tertiary carbons. 8. Which of the following is not a reaction variable for polymerization of polypropylene? Explanation: All the three variables, molar ratio of catalyst composition, catalyst concentration, and the reaction temperature are the reaction variable for the polymerization reaction of polypropylene. 9. Where among the following fields polypropylene cannot be used? Explanation: Polypropylene is used in the form of typical mouldings, which include components like automobile and home appliances, furniture and kitchenware, etc. and is not used for insulation purposes.